Ryan Kelly’s Pulitzer Prize-winning photo has been used in national news stories, in courtrooms and more recently in Spike Lee’s award-winning film BlacKkKlansman. The photo he snapped at the scene of the deadly car attack in Charlottesville on August 12th, 2017 has taken him all over the world. 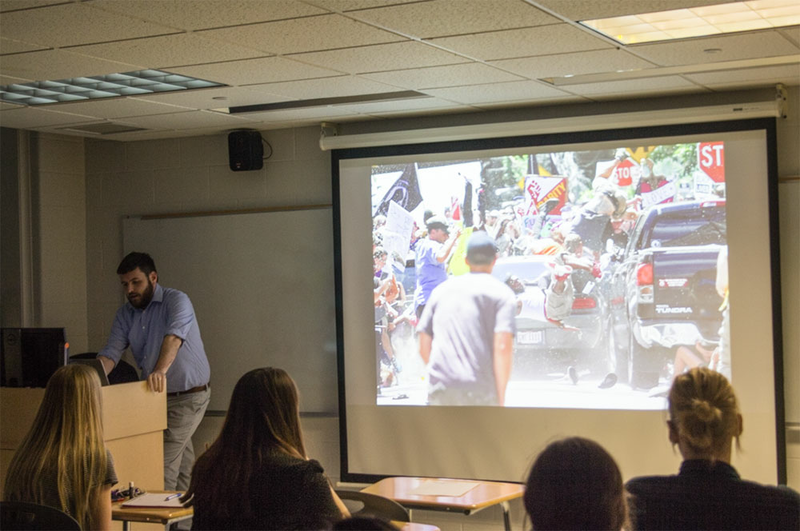 On March 14, Kelly spoke to SMAD students about the photo, that day and his experience of covering the events leading to the day. Kelly was one of the two photojournalists working for The Daily Progress, Charlottesville’s local paper, on August 12th, 2017. While Kelly was showing SMAD students the photos he had taken from that day and the weeks leading up to it, he was quick to point out that his primary purpose for being there was telling the story rather than meeting all artistic composition requirements. “It’s journalism more than high art,” Kelly said. Kelly was on Fourth Street in Downtown Charlottesville when the car came flying down the street. “In a moment it went from the calmest and the most peaceful it had been all day to chaos,” he said. His immediate reaction was to begin snapping photos as quickly as possible. Kelly took 74 photos within 21 seconds. “I knew that there was one specifically that was the picture,” he said. After the editor, the publisher and their lawyer weighing the photo’s decency to its newsworthiness, The Daily Progress published the photo. “It’s an amazing honor to be awarded one, but it came at the cost of somebody’s life and hundreds of people being terrorized for a weekend,” he said. The man flying into the air in Kelly’s photo, Marcus Martin, ended up shattering multiple bones in his leg. Martin took the full force of the car because he was pushing his fiance out of the way. A wedding planner found out about this story and threw them a luxurious wedding free of charge. Kelly was hired as a freelancer for The New York Times to shoot the wedding. These wedding photos are the ones Kelly always likes to remember when he looks back on that summer. “Just a beautiful, loving, happy, wonderful thing. It’s definitely the only part of this story that can be described that way,” he said. Despite witnessing what he called “the most horrifically violent” event, Kelly will always take pride in the coverage he and his team pulled off.